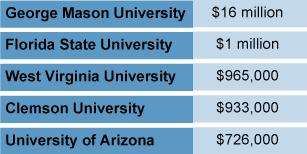 Koch foundations donated to 221 universities during the 2007-2011 period, giving as little as $1,000 to Wisconsin Lutheran College and more than $16 million to George Mason University. 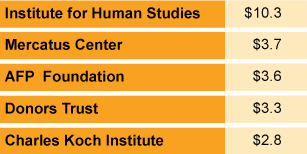 The Kochs donated to 89 nonprofits and one annual conference, all of which have public policy and educational missions synchronous with those of the Koch corporation — deregulation, limited government and free markets. The first person to sign the Koch-backed pledge was Republican Sen. Pat Roberts of Kansas, where Koch Industries is headquartered. Of the 85 conservative Republicans first elected to the House of Representatives in 2010, 76 signed the pledge and, of those, 57 received money from Koch Industries’ political action committee. The members of Congress who signed the pledge have also introduced several bills aimed at limiting EPA regulation of greenhouse gas emissions and limiting regulation of the nation’s biggest polluters. (For more about the “No Climate Tax Pledge,” see our related story.